This book is a marker of the "state of theory" today. 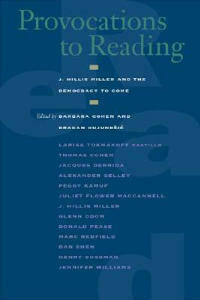 Its rich array of wideranging essays explores the dimensions and implications of the work of J. Hillis Miller, one of the most eminent literary scholars in America. For nearly half a century, Miller has been known for his close and imaginative engagement with the implications of European philosophical thought and for his passionate advocacy of close reading. Building on this intellectual legacy, the contributors instantiate and extend the practice and ethics of sustained close reading that is Miller's hallmark. The book culminates in a moving piece by Jacques Derrida, Miller's close friend of forty years, who engages Miller's readings of Gerard Manley Hopkins in a historic encounter between French philosophy and American reading practices. A provocation to reading for new generations of students and teachers, these essays offer important resources for grasping the question of language in historical perspective and in contemporary life-a task essential for any democratic future. Barbara Cohen is Director of HumaniTech at the University of California, Irvine. She is co-editor of Material Events: Paul de Man and the Afterlife of Theory. Dragan Kujunzic is Professor of Russian and Comparative Literature and Director of Russian Studies at the University of California, Irvine. Among his publications is The Returns of History: Russian Nietzscheans after Modernity.